Istanbul is the Asian version of New York. Being the only city in the world that spans two continents, it is a true melting pot of cultures and flavors, and the urban energy is dynamic and absolutely energizing, just like NYC. Want to escape the maddening crowd at the Grand Bazaar or Blue Mosque? Then you must definitely check out the quirky cafe scene in hippie Beyoglu district in Istanbul! Cihangir is Istanbul's trendiest neighborhood and artistic enclave, similar to SOHO in NYC. The bohemian culture draws artists, writers, actors and expats, and with that, a strong coffee/cafe/drinking scene is borned. Cafe Firuz is located at the heart of Cihangir (Cihangir Square). With the floor-to-ceiling window panes and open dining space that is characteristic of European cafes, it is the best place to people watch. Turkish and Western breakfasts are available all day err day and you'd be crazy not to dig in to the homemade fresh jams with börek (Turkish bagel), meats, and cheese. It's a little pricy but that's the price to pay for being a hippie (45TL for 2). Anahtar Sokak 13, Cihangir. Tel: (0212) 293 08 49. All Day Breakfast from 9am - 12mn daily. Akarsu Caddesi 29, Cihangir. Tel: (0212) 244 24 66. All Day Breakfast from 9am - 5pm daily. Smyrna Café is very popular with the locals and provides decent western breakfast staples like pancakes, English fry-ups, french toasts and more. Wash down the hearty meal with the variety of freshly squeezed juice blends! Defterdar Yokuşu 52/A, Cihangir. Tel: (0212) 293 64 37. All Day Breakfast from 8am - 5pm. Turkish breakfast is serious business at Van Kahvaltı Evi, a breakfast establishment that draws in the crowd day in day out. Once you beat the queue, your table will be covered with all shapes and sizes of cheeses, along with fresh bread, eggs, olives, honey, kaymak cream and jams. No monkey business around here (see guy giving me the evil eye). Only serious eaters are entertained (i'm kidding). Other branches are available in Nişantaşı and Kuruçeşme (aka ADA Cafe) but the Cihangir location remains the best. Palaska Sokak 1, courtyard of the Firuzağa Mosque, Cihangir. Tel: (0212) 244 46 37. Breakfast from 9 am - 2pm daily. Plenty of organic produce for the taking right here at Idilika. Enjoy Aegean inspired food, alongside Turkish breakfasts with a twist under a canopy of vines. Greek staples such as sundried tomatoes, crushed olives, and homemade jams are common features here. The menemen (scrambled eggs) has also been enhanced with parsley, feta, potato and kaşar cheese. What's best? The unlimited provision of tea on weekends. Kuloğlu Mahallesi, Firüzağa Cami Sokak No.2/B, Cihangir. Tel: (0212) 249 92 71. 10/10.30am - 9pm daily. One of the rare coffee brewery in Istanbul with a menu of single-origin beans, there's no doubt why it pulls in the expat crowd. You can get your coffee in whatever style you fancy- espresso, drip, pour-over, chemex.. What's best is the affordably priced beans that you can bring home. People watch on the patio or head downstairs to enjoy your cuppa with a magazine. Pets are invited too. Galata is a lovely base for traveling in Istanbul in my opinion, It's not quite as quaint as Cihangir but it has its own charm. Dining options are plenty and western food is readily available. There's even the publicly listed Shake Shack burger joint (i didn't quite expect that). Explore those at your own convenience but i know you want something special. Here's a list of interesting cafes to check out in Galata! Galibdede Caddesi no. 85, Galata. If you wander around the Galata Tower area, you'll notice plenty of coffee shops aka. kahvesi. Of the lot, Latife Turk Kahvesi is the most packed and you'd have coffee drinkers spilling onto the side walk any time of the day. They serve decent coffee and are a good alternative if you're too lazy to make a trip to Kronotrop. I could smell the Brooklyn in this establishment when i saw it. Wolf Junior is the international sister restaurant of Waffle and Wolf in Brooklyn and it seems like the owners have transported a piece of Brooklyn over. American food dominate the menu with waffles sandwiches and mac & cheese. Gluten free options are available here. Head down to Wolf Junior for breakfast, brunch and dinner (if you take breakfasts for dinner). They also do meat and seafood mains at night. Enjoy the well designed library-like space as you dig into heartier options provided by Sntrl. Boys do not have to fear going hungry with popular (and heartier) options such as Club Sandwich, Spanish hamburger, or even if you fancy a grilled steak for breakfast. Eggs Benedict is recommended here if you must have eggs. Swedish coffee is served here. LAST BUT NOT THE LEAST. MY ABSOLUTE LOVE. Tımarcı Sokak, No. 3/B, Galata. Tel: (0212) 293 20 55. All Day Breakfast served from 9am - 10.30pm daily. Where do i even begin! On my last morning in Istanbul, i got up early and made a beeline for this lovely cafe tucked in a side street near Galata Tower (i was first in line). One must simply order the Köy Kahvaltası (village breakfast, 30TL) here. After i placed my order, it was a non-stop flow of food coming from the kitchen, until my tabletop was completely covered! 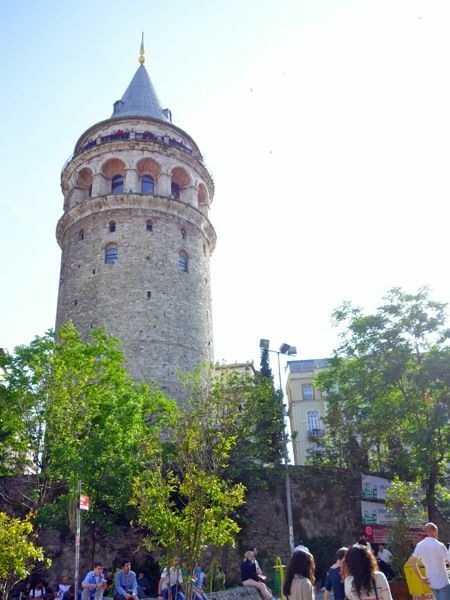 Enjoy the view of Galata Tower while dining at Privato Cafe. This is definitely my favorite cafe in Istanbul! Please please do visit them. I was glad that i insisted on staying on the New European side of Istanbul. I think it's a nice break from the touristy vibe in Sultanahmet and it's definitely more chill. Hope my Best Cafes in Beyoglu Istanbul list will provide you with a different experience in Istanbul!